I recently went on a road trip with a very difficult mission – finding the most magical places in the Scottish Highlands. Just kidding, it was literally the easiest thing ever. The towering mountains, the glimmering streams, the vast plains, it hardly matters where you look because this part of the world is overflowing with the supernatural… or at least the supernaturally beautiful. My entire road trips consisted of me oohing, aahing and feeling like I was a cast member on ‘Game of Thrones’. That’s ironic because the show’s producers originally wanted to shoot it in Scotland but couldn’t because of subpar studio space, making the country lose out on about £160 million. Meep. Oban was my favourite stop of the entire road trip around the Scottish Highlands, so it only seems fitting to start my list with it. This busy harbour is the perfect gateway to the neighbouring isles but leaving it (ever) would be a mistake. The town is full of quirky shops, romantic hotels and it even has its own Colosseum lookalike overlooking it from the top of a hill. It’s also the seafood capital of Scotland and home of the Oban Distillery. What a gem! The Lost Valley (or Hidden Valley as it’s otherwise known) is located in Glencoe, which has recently been voted the most romantic glen in Scotland. Spoiler alert: They’re all pretty romantic so that’s one hell of an endorsement. You’ll need good shoes because the path is steep and very rocky – in the winter you’d probably need an ice axe and crampons! The 2.5 mile hike can be completed in 2-3 hours, depending on your level of fitness and how many selfies you want to take. Pack your camera as the views are stunning! Portree is the largest town on the Isle of Skye in the Inner Hebrides. It’s also breath-takingly beautiful in a dollhouse kind of way – those candy-hued houses lining the harbour make for a pretty magical scene. Fun fact: the town was featured in the Harry Potter books as the home of a professional Quidditch team called the ‘Pride of Portree’. I wouldn’t be surprised if there was a wizard colony somewhere on the island. The Enchanted Forest near Pitlochry is a stunning lighting show set to the backdrop of autumn woodland. Expect aerial artists magical fairies flying between the tree tops, story-telling in a yurt and steaming cups of hot chocolate. While you’re near Pitlochry don’t forget to check out Killiecrankie, a gorgeous wildlife trail through the woods. It’s home to Soldier’s Leap, a place where a soldier literally leaped 18ft (5.5m) across the fast River Garry and successfully escaped a group of Jacobites. The original parkour master! With its sprawling gardens and three floors of stunning chambers, Blair Castle feels like a fairy tale come to life. Dating back to 1269, it has undergone lots of changes – from cold medieval beginnings to an opulent Georgian mansion to the Disney-like Victorian castle it is today. There’s a lot more to Isle of Skye than Portree. If you can brave the cold, the Fairy Pools are the perfect place for wild swimming. Don’t disturb the fairies who live there though because the locals are quite fond of them! You see, for many hundreds of years it was isolated from the rest of Scotland and settled by both Celts and Vikings. While the rest of Britain was undergoing the Industrial Revolution life on Skye continued as normal. All that helped Skye preserve a lot of its magic, stories and traditions which make it one of the most uniquely magical places in the Scottish Highlands. Oh, and if you’re not one for magic visit the Talisker distillery – their smoky whisky might convince you otherwise. I’m sorry to disappoint you right off the bat – Castle Stalker’s name actually comes from the Gaelic ‘Stalcaire’ meaning hunter or falconer. But don’t let that dissuade you from visiting because looking at the castle from Port Appin as the sun sets over the loch is spectacular. If you’d like to go inside do your research first as the castle is privately owned and there is only a limited number of tours each year. I like an underdog which is why I featured Castle Stalker instead of the oh-so-popular Eilean Donan castle. But if you haven’t heard of the latter, definitely check it out as it’s one of Scotland’s most iconic castles. Right after Edinburgh Castle that is. How could I not include Loch Ness on this list? Who hasn’t heard of Nessie, the lake monster, and wished she was real? Her existence has never been proven, but that’s all the more reason to visit and maybe – just maybe – be the one who discovers her. While you’re there pay a visit to Urquhart Castle, which was constructed in 580 AD as a Pictish fort and remained active until 1692. It gradually deteriorated until 1913 when it passed into state care and has since become one of Scotland’s most visited castles. 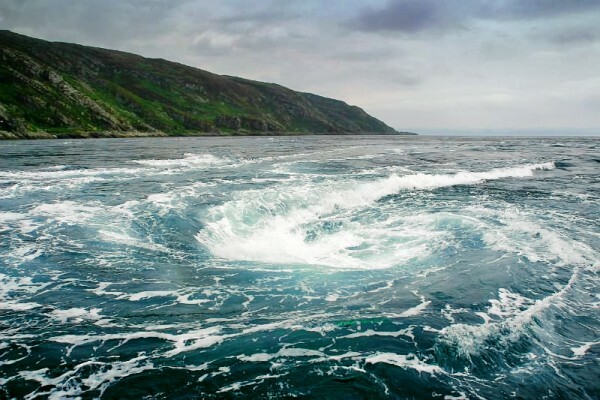 Corryvreckan is the third largest whirlpool in the world, with giant nine-metre waves crashing around it. The resulting maelstrom can reportedly be heard up to ten miles away. According to legend, a Scandinavian prince fell in love with a local princess and her father consented to the marriage on the condition that Breakan anchor his boat in the whirlpool for three days and three nights. Unfortunately, on the third night his rope broke and the boat was sucked down by the current. Breakan’s dog dragged his body ashore and… well, I’m not sure what the morale of the story is, but do go with a reputable provider. If you like Stonehenge, you’ll love the Callanish Stones! They were put up around 2900-2600 BCE and the site became the place for rituals during the Bronze Age. If Lewis in the Outer Hebrides doesn’t seem cool enough, you can trek further up north to Orkney. There you will find the Ring of Brodgar – the third largest stone circle in the UK. I’ve kept the Glenfinnan Viaduct for last as it’s literally one of the most magical places in the Scottish Highlands. You may not know its name, but I can almost guarantee you’ve seen it before. Why? It’s where many Hogwarts Express scenes were filmed and it was featured in four of the Harry Potter films. Seeing it up close is always amazing, but make sure you look up when the heritage Jacobite steam train is passing through to get that iconic shot. I didn’t and I’m still kicking myself. Not too much though – now I have the perfect excuse to go back. And in case all that wasn’t enough, here’s one more – a fairytale cottage in Luss, overlooking Loch Lomond. Isn’t that the perfect getaway? What are your favourite magical places in the Scottish Highlands? Where else in the world should I go to find enchanted hideouts? We are doing a roadtrip around the highlands this coming May, I can’t wait! Saving this post for planning! Scotland has so many magical places, no matter how many times we roam it, we are always finding new surprises, hidden glens and amazing spots to park the camper. It’s perfect for road tripping, especially if you have a camper van or RV! That’s amazing, I’m so jealous of you right now 😀 What was the winter like in Oban though? Must have been tough! Great photos! I’ve only done Edinburgh and Glasgow and Stirling in Scotland. Oh my goodness, I’ve been wanting to visit Scotland for so long, and this is making me want to visit even more! Everything about Scotland just looks so gorgeous! How wonderful do all of these places look? I’ve been to Scotland three times this year but unfortunately never made it as far as the highlands – would love to explore soon. As a Leodhasach (someone from Lewis), I obviously think that the Callanish Stones should be number one 😉 In all seriousness though, it’s a great list – Oban has been on my to-visit list now for a while! I have never been to Skye, but my two favourite places in Scotland are definitely the Isle of Iona, Tobermory on Mull and the valley between Inverness and Ullapool in Wester-Ross. Just superb! It’s lovely isn’t it? I traveled through the Highlands on my way to Isle of Skye earlier this autumn, and I was simply stunned by all the beauty. Scotland, you babe! OMG #3! The pink houses are too cute! I’m dying to go back to Scotland, you’re a lucky girl! Scotland is my biggest guilty travel regret/shame! My whole life lived in northern England and I’ve never explored Scotland! I need to add it to my list, the pictures make it look amazing! Gorgeous – I’ve only visited a few bits of the Highlands but the train ride from Inverness to Skye was stunning. Love those houses in Portree too. wooow, such gorgeous landscapes! lucky you to have seen that with your own eyes Sabina! Love this post!! Really inspired me to want to travel to Scotland. I shared a link to this post in my most recent blog post, hope you don’t mind.